The purchases for June 2017 were all part of a single wave. 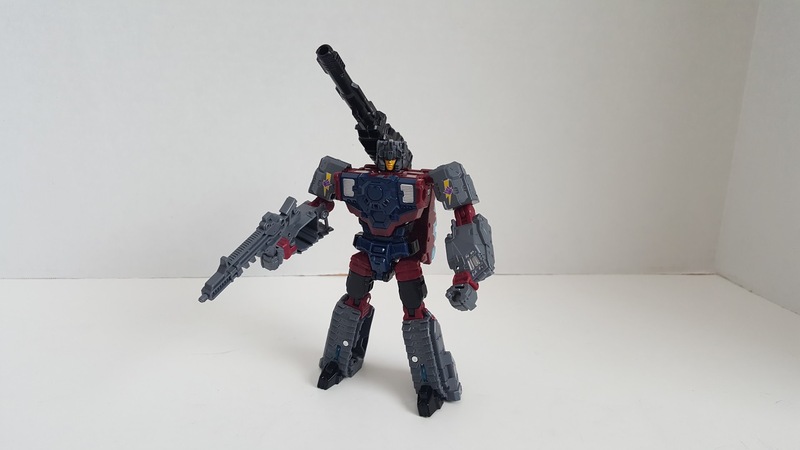 All figures are deluxe class, from Titans Return. All have Titan Masters that transform into the head (or Headmasters, if you prefer G1 terminology). 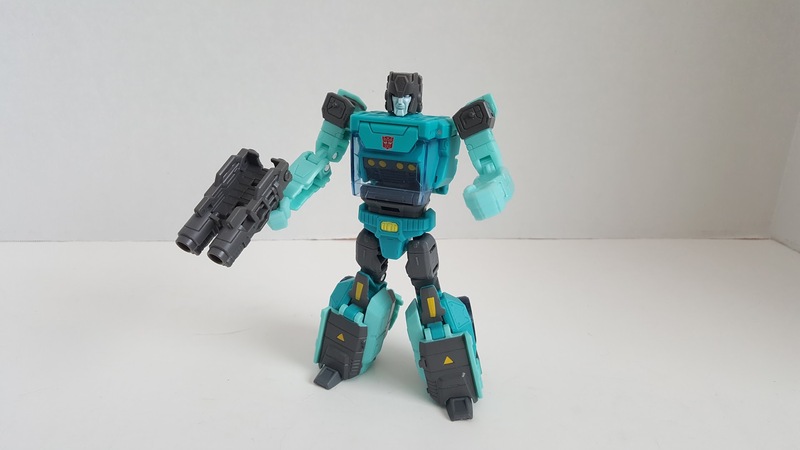 The last time we got a Kup figure in the CHUG-verse was back in 2011, so we are long overdue for an update. We already got updates to Hot Rod and Blurr in Titans Return, so Kup should come as no surprise. I like TR Kup. For starters, this Kup has an alt mode that is most G1 accurate since the original G1 figure. I like the 2011 Generations Kup, but that figure’s alt mode did not resemble G1 Kup’s alt mode in the least. 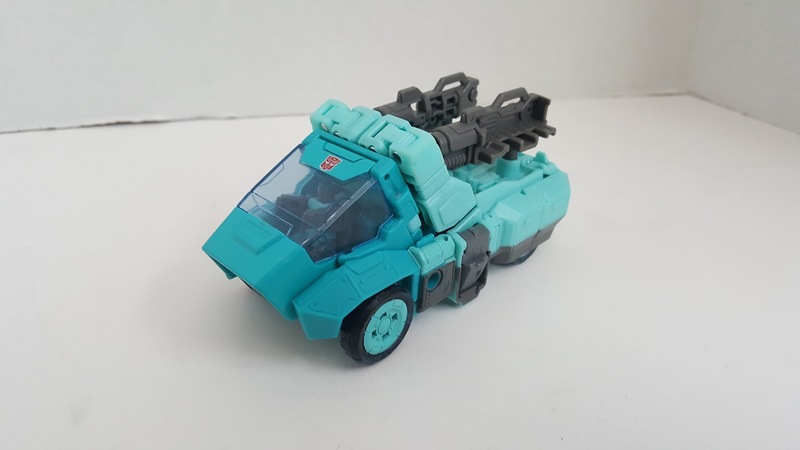 TR Kup has ample room up front to fit the Titan Master in vehicle mode, and the twin weapons can be stored on the bed of the pickup. TR Kup offers one of the more refreshing transformations that we got in recent years for a retail deluxe figure. The leg transformation is worth mentioning. The truck side panels open up, and folds upward to form the legs. It’s very cool and very original. Arms are tucked behind the cab in alt mode. The cab area collapses on itself to form the torso in robot mode. 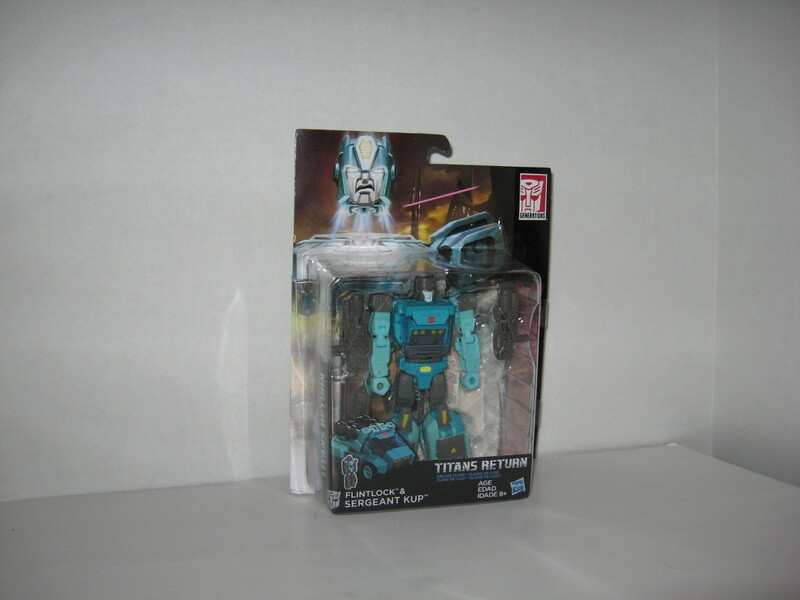 Fans will undoubtedly compare this Kup to 2011 Generations Kup. It’s hard to say which is superior. They each have their pros and cons. TR Kup has a more show accurate alt mode and an overall cleaner design. Generations Kup has a more show accurate head mold (since he’s not a Headmaster). Other aspects are up for debate. I would keep both Kups in my collection. 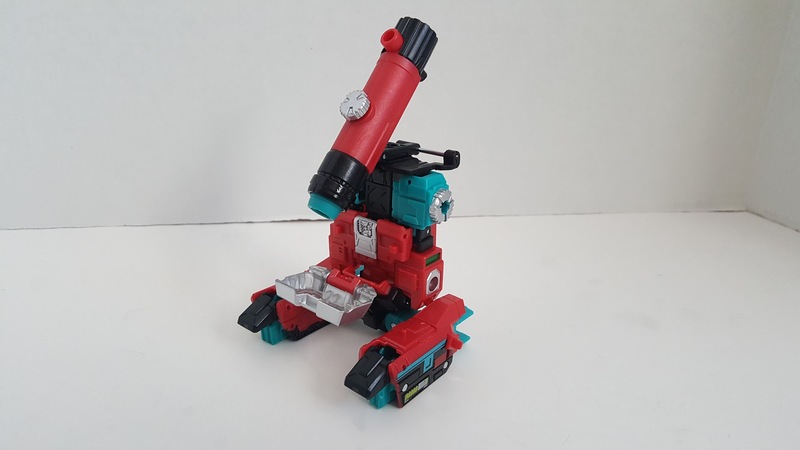 I think this may be the first time we got a Perceptor that transforms into a microscope since G1 (not counting G1 re-issues). In TR, Perceptor too is a Headmaster, but it doesn’t bother me. I like the microscope alt mode. It doesn’t really look like a real microscope in my opinion, but the G1 toy had the same issue as well. 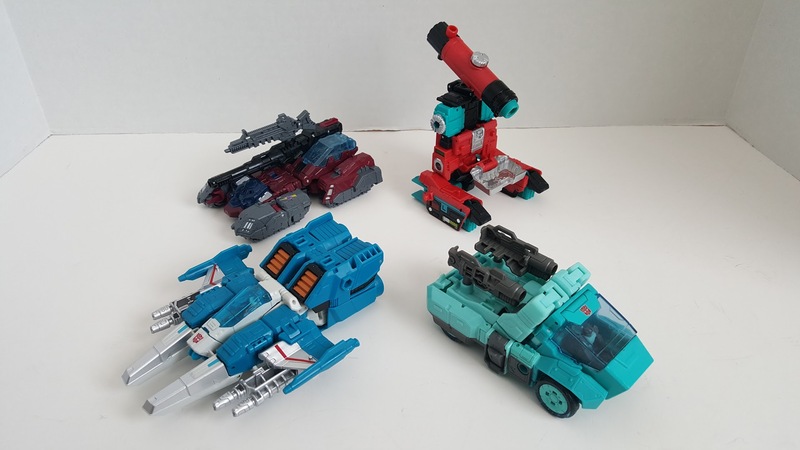 I believe TR Perceptor has another alt mode where he’s a tank, with seat area for the Titan Master. I didn’t try this though. Transformation to robot mode is fairly simple. If you look at the two pics, you can kinda see how he would transform. And you would be right. There aren’t any hidden surprises to this transformation. And that’s not a bad thing. Not every Transformer needs to have original engineering mechanisms. Sometimes sticking to the tried and true is best, if it’s executed well. Perceptor comes with a long rifle type weapon, complete with built-in gun rest. I think this totally works. In battle, I see Perceptor as the type that would stay back and pick off his enemies from long distance with extreme precision. 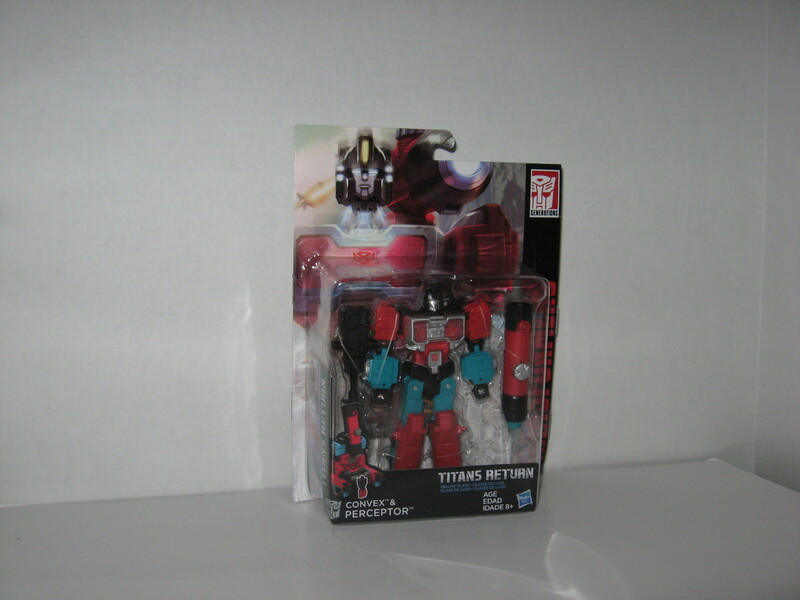 I would say this is the most show accurate G1-style Perceptor that we have got. For that reason, I recommend TR Perceptor. He is a bit flimsy in construction in my opinion, but nothing here is so bad that it’s a deal breaker. 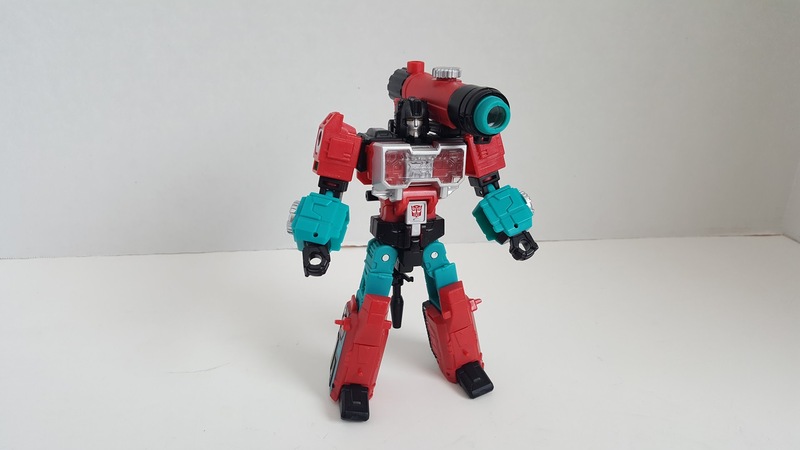 Fans would undoubtedly compare TR Perceptor with Generations Perceptor (who also was released at the same time as Generations Kup). TR Perceptor is way more show accurate, but there are things I like about Generations Perceptor too. They both have a place in your collection. TR Topspin is my favorite figure this month. 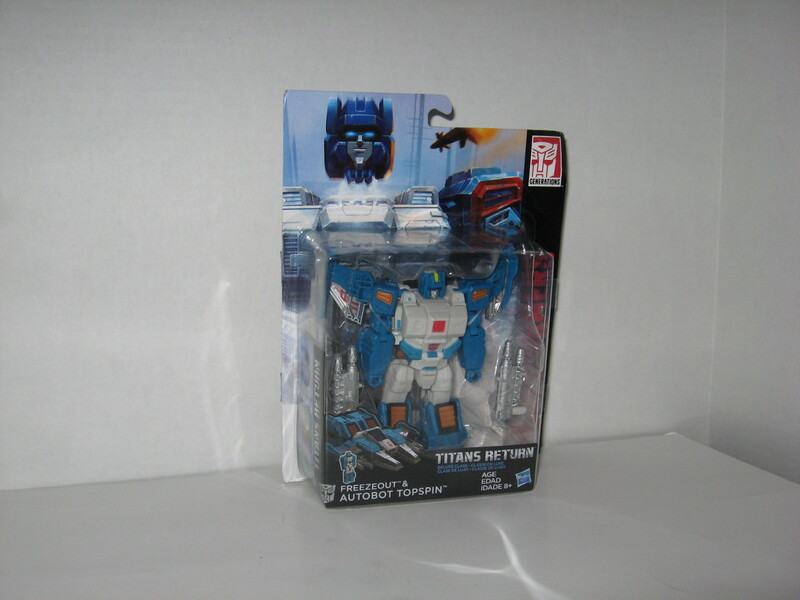 I am not sure if Hasbro has released any direct updates to this character since G1. This may be the first time, and that’s a treat. Topspin and his near-identical clone Twin Twist were Jumpstarters in G1. The gimmick of this little known subgroup is that they have pull-back motors and they auto-transform. You start in alt mode, lay them on a flat surface, pull back, release, then watch them roll forward and automatically “jump” and transform into their robot modes. Yeah, it’s a crazy gimmick that only kids would dig, but it represents toy technology that was popular back in the 80s. Because of this gimmick, the Jumpstarters had very simple transformations, even for G1 standards. There are really only two steps to the transformation: legs rotate forward by 180 degrees, and stand the figure. That’s it. Transformation is achieved automatically through the gimmick. I imagine modern day 2-Step Changers are highly similar, but I don’t have them so I can’t say for sure. The Jumpstarters never got any love in the G1 cartoons. I imagine they were last minute additions in Season 2 in the toy line, so they got left out in the cartoon planning. The toys themselves were also forgettable to the more mature collectors. I’m gonna guess that, for these reasons, Hasbro never saw fit to update them. Until now. And what a update it is. Using toy technology available today, Topspin is a very impressive figure from a engineering perspective. Yet he still retains that 80s futuristic and blocky robot aesthetics. This is definitely a figure catered to fans that grew up with robots in the 80s, and I commend Hasbro for giving us something so advanced and so nostalgic at the same time. The Jumpstarters are supposed to be futuristic or Cybertronian in their alt modes. Topspin is a jet, while Twin Twist is a drill tank. The G1 toys were near clones of each other (think G1 Bumblebee and Cliffjumper), and in TR that still applies. I like Topspin’s alt mode. 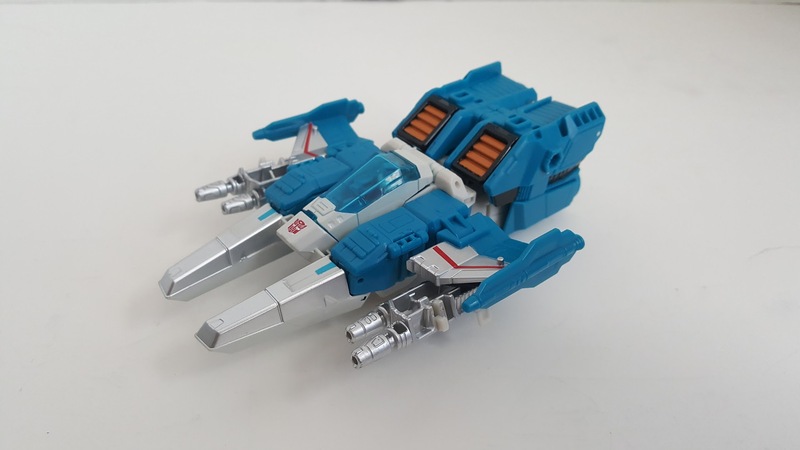 It’s unmistakably Topspin, there are no other alt modes that resemble this in the entire TF Universe. Colors and paint job are superb. A Titan Master can sit comfortably in the cockpit. The twin guns can be stored underneath the wings. Transformation is where this figure truly shines. In G1 it was super simple, but in TR it is 10 times more advanced. The legs come apart where they are in alt mode, and then they are extended Combiners Wars style. Flip out the feet and collapse the rear leg panels. Fold the knee panels forward. Arms come out from the sides of the vehicle alt mode. Extend the arms and flip out the fists. Rotate the wings back. And here’s the part where it’s really cool: rotate the entire chest assembly 180 degrees, so the legs are now directed the other way. Open the cockpit and remove the Titan Master, then fold the front nose assembly into the cockpit area. Then close the cockpit. Rotate figure at the waist. Transform the Titan Master to head and insert. I’m glossing over the process very quickly, but you can already see it’s a pretty involved transformation for a retail deluxe figure. I wouldn’t say that it’s difficult by any means, but the number of steps required does surprise you. In some way I say this is the best kind of Transformer as a toy: involved enough for the mature collector, but not difficult or frustrating. In robot mode, TR Topspin is a perfect homage to G1 Topspin. 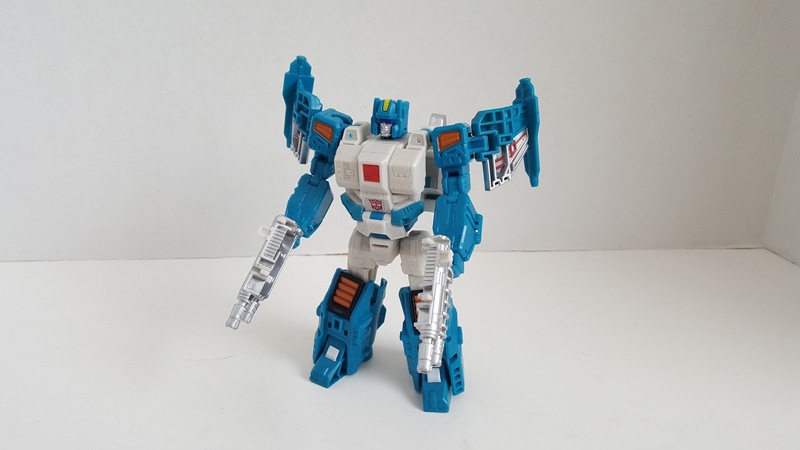 His overall appearance is trademark Topspin. Articulation of the figure is decent, and overall construction is solid. Topspin and Twin Twist both had very blocky heads in G1, so as Headmasters, it works. I cannot recommend this figure enough. Get yours now. You may have purchased Apex and Geminus by Mech Ideas. I like those figures too, but I would still get TR Topspin and Twin Twist if you got those 2. Mech Ideas and TR are separate efforts on updating the Jumpstarters, and both efforts have produced quality figures worthy of inclusion in your collection. 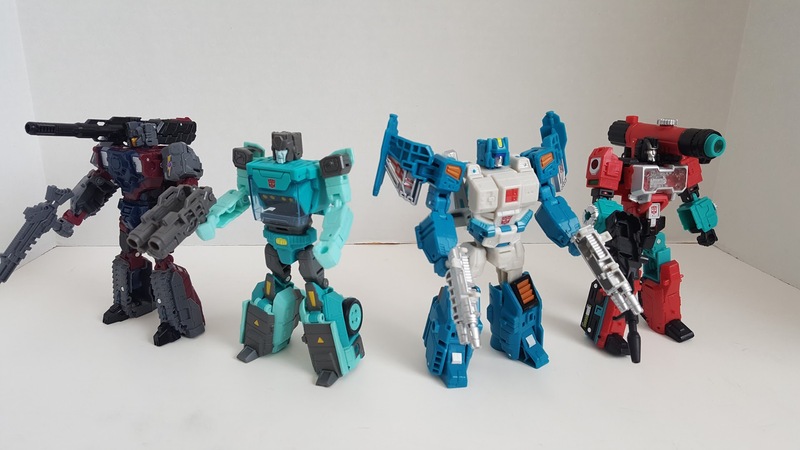 Kup, Perceptor, and Topspin were bought from Target on the same trip. I initially did not wanna buy Quake, because he’s a repaint of Titans Return Hardhead. 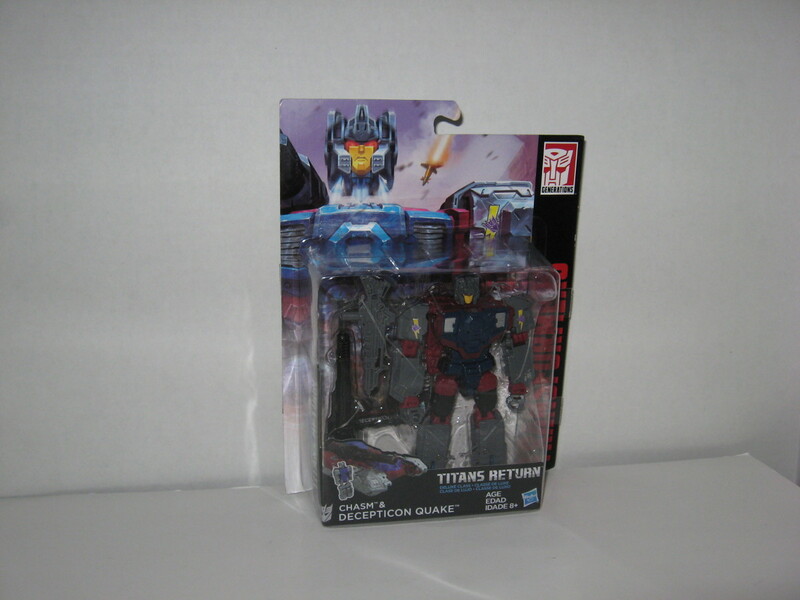 And Quake is one of those repaints that make little sense. 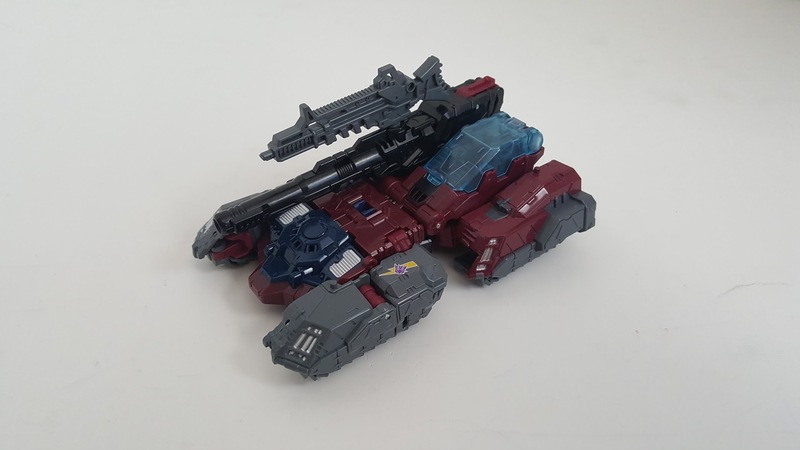 In G1, Quake’s tank mode is that of a modern day battle tank (Leopard 2), and this TR futuristic/Cybertronian tank mold used for Quake is unique to Hardhead. Plus Quake was a Targetmaster, not a Headmaster. Using this mold for Quake reeks of cash-grab desperation. Still, the G1 purist in me got to me. I have G1 Quake, so I figured what the hell. One more repaint won’t hurt. So I went back to Target a few weeks later and obtained Quake. See my review of Titans Return Hardhead for my thoughts on this figure. I think Quake is a bit better constructed than Hardhead, at least on my copy. He doesn’t feel as flimsy. I give Quake a mediocre rating. If you didn’t get Hardhead, or if you simply have a thing for Quake, then go ahead and buy this figure. Otherwise this is an optional purchase. Below are group photos of all the purchases this month. I should mention that there is another deluxe figure as part of this wave. That figure is Krok, a repaint of Skullsmasher. I was not terribly impressed with Skullsmasher, and I never even heard of Krok the character, so I left this on the shelf. The toy is very playable. I want to buy it. At home playing it. How much will I get? I want to buy it.